So October, where did you go. It felt like a really busy month, yet when I look back I'm sat here going what did I actually do... So in no particular order, here are my five highlights from October. Yes, I've been before, and yes I've already blogged about it, but it was such an awesome day and experience. It felt great to go somewhere outside of our little norm and go somewhere we'd both really appreciate. Adam's never really bothered about doing much, or seeing much, but he will go for me, but it's great to find something we both loved and enjoyed. It was a truly magical experience, one I'd highly recommend. My favourite part? Platform 9 3/4 - talk about magic. My regret? Not buying the Gryffindor pyjama bottoms. I'm going to be an Aunty! I found this out back at the beginning of August, and for someone whose usually not a baby person I'm super excited about meeting this one. My brother and his girlfriend decided they wanted a gender reveal with our close family, so I popped it all together and made a cake to reveal the gender. My brother already knew, but his girlfriend didn't, and it was so lovely to see her reaction. They really wanted a little boy, and that's exactly what they're having, so I couldn't be more excited for them. It's also really nice to know what it is so I can stop calling it my niecphew. Yup, I'm going to trademark that term! Sounds like a really small thing, but it was such a lovely way to spend a Sunday for me. Sunday's are usually spent doing chores so a nice pub lunch was exactly what I needed. We also went with my Mum and Dad, which was great because I hadn't had much of a chance to catch up with my Dad lately and there's been so much going on it was nice to just hang out with him, chill out and enjoy some incredible food. The food was amazing as well, a roast with about eight vegetables, incredible gravy and mouth watering deserts. Would highly recommend it. Sounds super boring, and a bit like um, how is that a highlight... But! I work from home, and since I started working from my own house (thanks Sky for installing 7 weeks after move date) I've been trying to find the best routine to get me motivated, up in the morning and ready to work. I just feel like it's so important when I work from home to get me in the right mind set and not just sit around in my PJ's all day getting distracted. I feel like I've finally got my routine down, and that I'm happy with it. I get up, I get in the zone and I get productive. If you want me to do a post/video on my routine just let me know in the comments below! 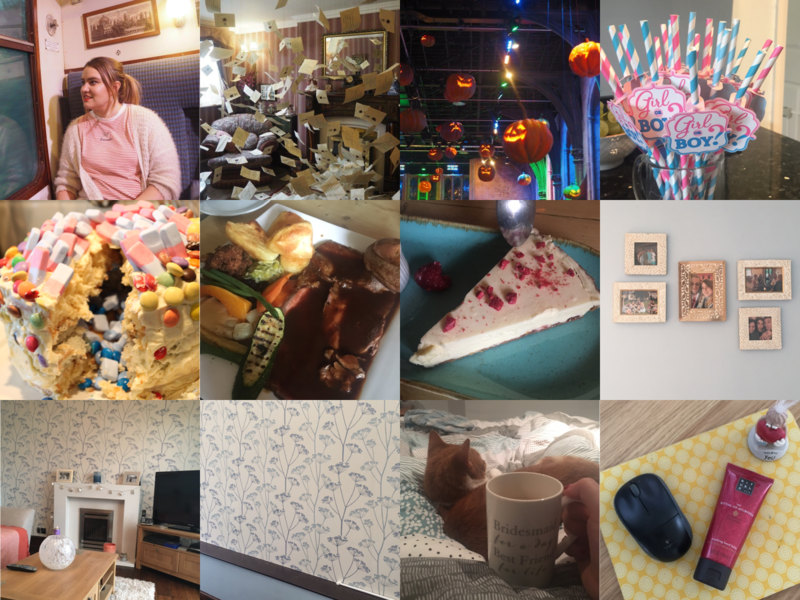 If you want to see what I'm doing through the month then make sure you follow me over on Instagram, but generally October has been a pretty good month! I'd love to know what your October highlights are so pop them below!